Hot Diggity Dog!!!! My second cloche party. This time I came to the party prepared. The first party I joined in the Spring of 2010 was a new experience for me. 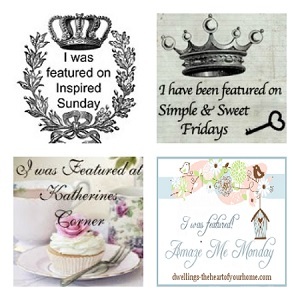 I had started to blog and I didn't own ONE cloche, but I looked around the house and I found Cloches...... I love cloche parties. 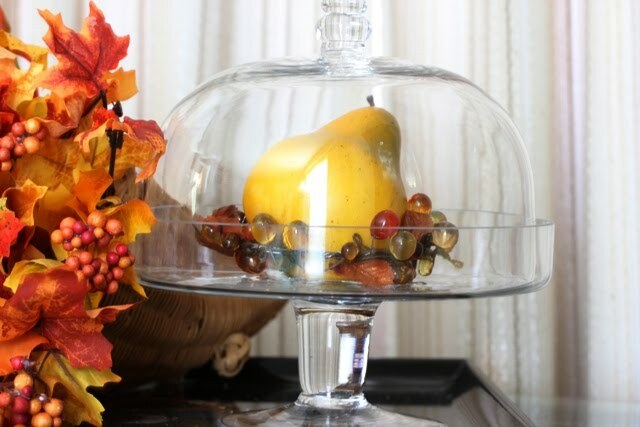 Marty is having a Fall Cloche Party. 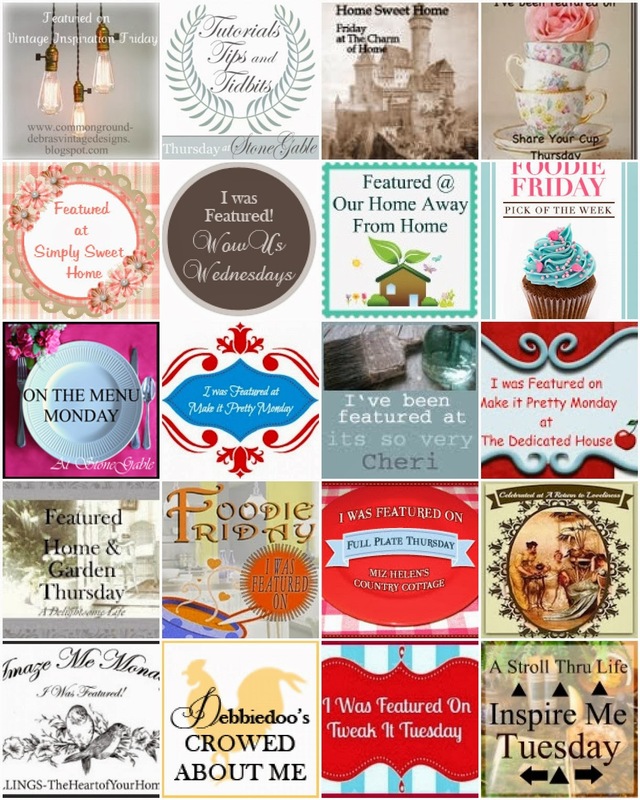 Please stroll over to A Stroll thru Life to see the amazing cloches. And, stroll over to Cindy's My Romantic Home for Show and Tell Friday. There are wonderful things to see. Since we are in the fall spirit. 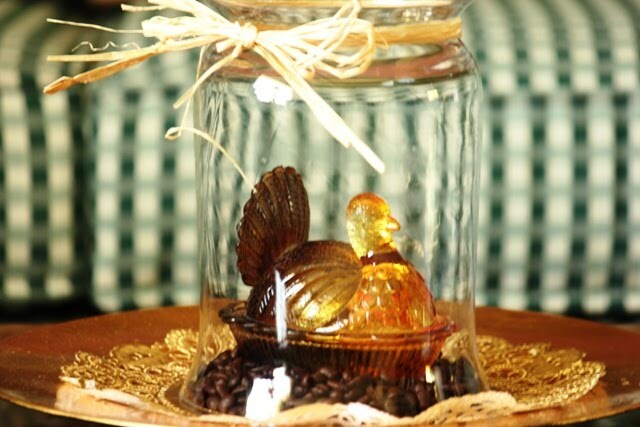 How about one turkey sitting under a vase in some coffee beans and a piece of raffia tied to the bottom of the vase. Mr. turkey is sitting on my coffee table in the living room on a gold charger and a gold doily leftover from my 50th Wedding Anniversary party. One sweet very inexpensive cloche. I see a little bird peeking out of a cloche. A group photo. 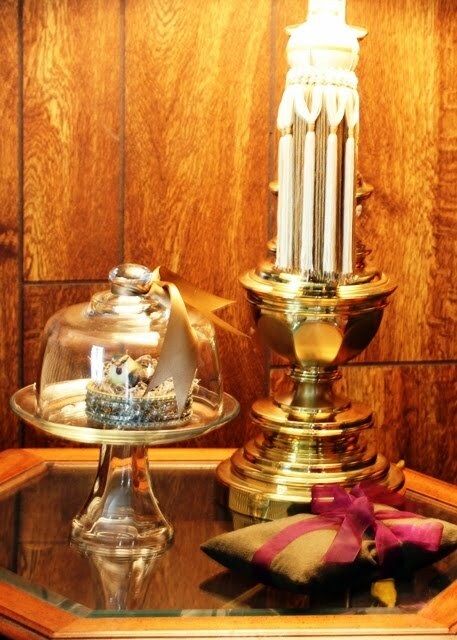 I put some coffee beans in the cloche to stabilize the candle. I love this bird. I found him at a yard sale in a bag filled with thread. The cloche is a cheese cover and the base is a small cake plate I found at an estate sale. Of course a book about Greece sits on the coffee table, just in case I want to look back and dream about the beautiful blue-domed churches in Santorini. This cloche was a gift I received for my 50th Wedding Anniversary in July. The arrangement sits on a glass table in the living room next the west window. We live in very hot weather so I keep the drapes closed all summer long and the little lamp makes a great night light. The cornucopia I have had for years........ The cornucopia is a symbol of food and abundance dating back to the 5th century BC. I found this very small anniversary clock at a yard sale. 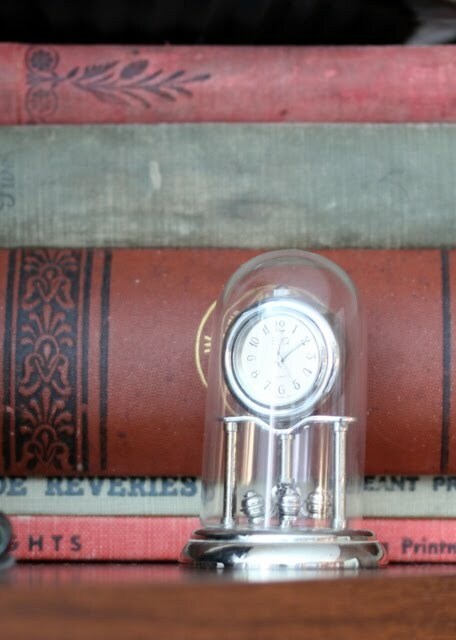 The little clock is sitting on top the bookcase in my living room. 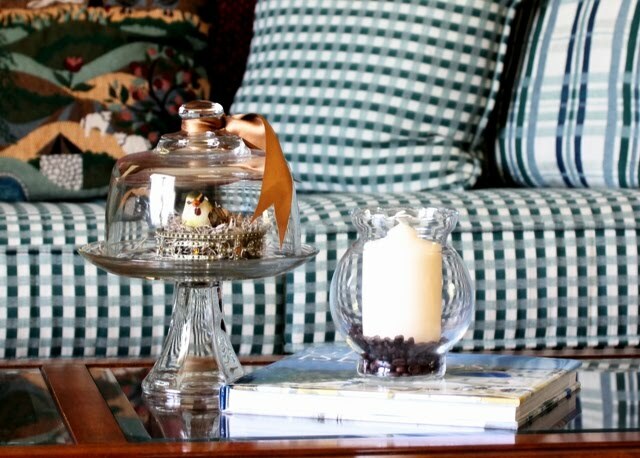 I thought the bird cloche would add something nice to my end table in the living room. And the tassel is cut off a long cord that was to pull draperies back. I think it works well with my fall accessories. The sachet is filled with cedar balm. I just shake it and the whole room smells like a forest. In the dining room I have a buffet table. The cloche is a cake plate with two hand carved ducks I bought in Mexico from a little Mexican boy standing outside a restaurant. And, the floral arrangement is handmade by me in my craft room with some floral I used in My Cozy Corner last year as decoration. I tried some different light for this photograph, and the copper cup and ducks are not blurred by the reflection of light as in the previous photos. 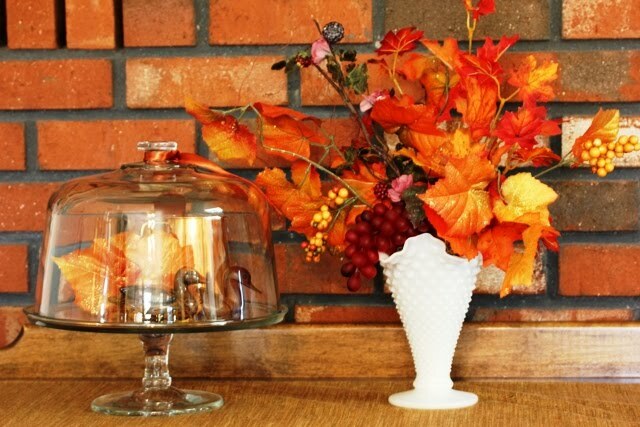 Hopefully you have enjoyed my Fall Cloche Party. I was delighted to entertain you. Don't forget to drop by Marty's house and Cindy's house too. I would love to read your comments on this post and become a follower too. You did good~! I have one of those glass jars, so I wish I'd thought of that.. It all looks so pretty and fallish..
Hi Betty! Love your displays! I love that little turkey dish under the cloche. 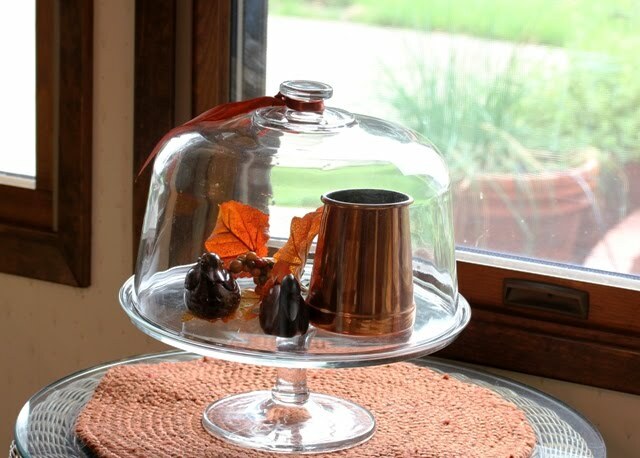 Well my friend, you have certainly created some beautiful autumn cloches! I enjoyed each and every one! 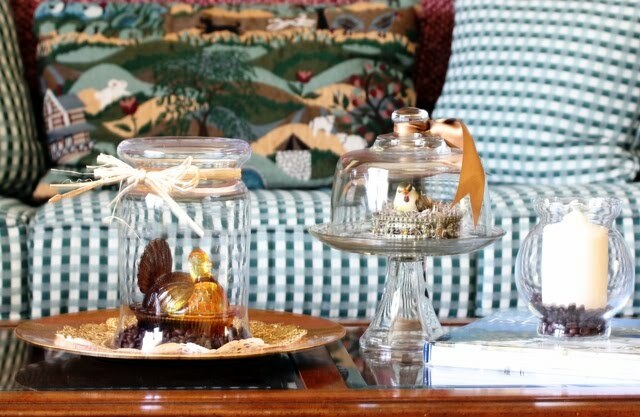 I think my favorite is the sweet bird cloche...of course, I just love all sweet little birds...so I'm a bit partial! Hehe! I love the little wooden ducks as well! 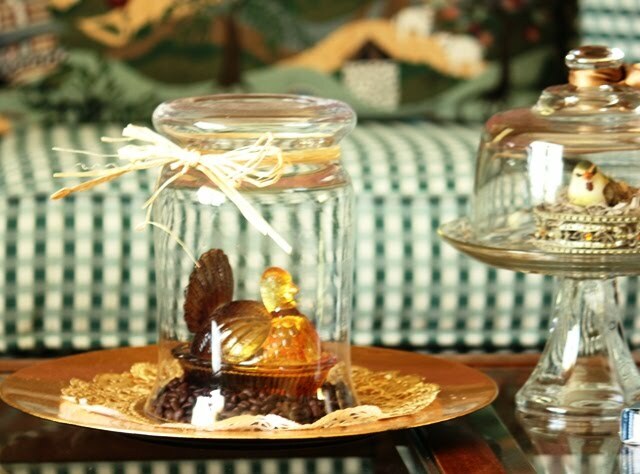 Thank you for sharing all of your beautiful autumn cloches with us...such a treat, my friend! These are so pretty! I went to Greece this summer -- truly my dream trip of a lifetime! These are so beautiful, Betty. Loved seeing what you have done. 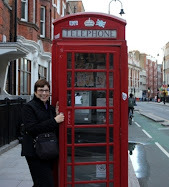 So sorry I haven't really looked at blogs the last three months. But so happy to see what you have done.